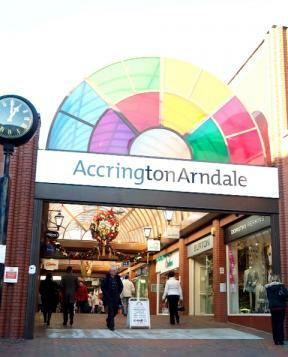 Accrington’s Arndale Shopping Centre stands on the site of an old cinema which was long thought to be haunted. There had been a cinema here since 1937, although it changed its name several times. At first a Regent, it was sold in 1945 to the Odeon group, in 1967 to the Classic chain and finally, in 1973, it was bought by Unit 4 who turned it into a multi-screen cinema. It is from this last period of conversion that the earliest known stories come. One workman, described by a workmate as a ‘pretty hard-boiled, down-to-earth sort of chap’, left the building in terror after feeling a ghostly hand settle on the back of his neck and then grab his hair to pull his head backwards. He refused to come back on site after that. When the cinema manager heard this story, he could not dismiss it as he had also had strange experiences. He reported how he had once watched in disbelief as the stage curtains swept closed in the middle of a film. No-one had been in the right place to operate that machinery; it remained a mystery that was never solved. He also said he had seen a ghost – a small, shadowy man. Other staff members had sometimes seen dancing blue lights. Eventually the old cinema was demolished entirely, to be replaced by the modern Arndale Centre. Now, shops directly on the site of the old cinema also report their fair share of weird happenings, notably strange noises and the unexplained triggering of burglar alarms. It has been suggested that there is a natural explanation for these effects. During the construction process of the new shopping centre, a stream had to be culverted and it now runs directly beneath the shops concerned. During heavy storms, the force of water rushing underground may be producing mysterious noises and, who knows, shaking the fabric of the shop-buildings and triggering burglar alarms. Interesting! Something you never forget, isn’t it. Not that it’s happened to me very often… do tell more if you can think of a good example, I’d love to hear about it.